A minimally invasive technique called Tateru Shiraishi cervical laminoplasty is the best choice for treating patients with cervical myelopathy as it reduces the need for long postoperative care, according to doctors. Cervical myelopathy is caused by a narrowing of the spinal canal, leading to cord dysfunction. Laminoplasty is a surgical procedure that creates more space for the spinal cord and nerve roots to relieve abnormal pressure on the spinal cord, according to the Virginia Spine Institute in the US. Dr Vo Van Thanh, a consultant for HCM City’s Trung Vuong Hospital, said that cervical myelopathy is more frequent in Asia Pacific, including Vietnam, than in other areas of the world. 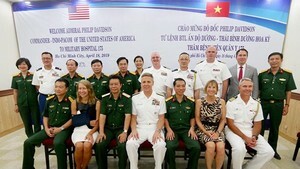 However, as advanced diagnosis techniques such as MRIs are now available in the country, the number of patients with cervical myelopathy has increased because of early detection, Thanh said. 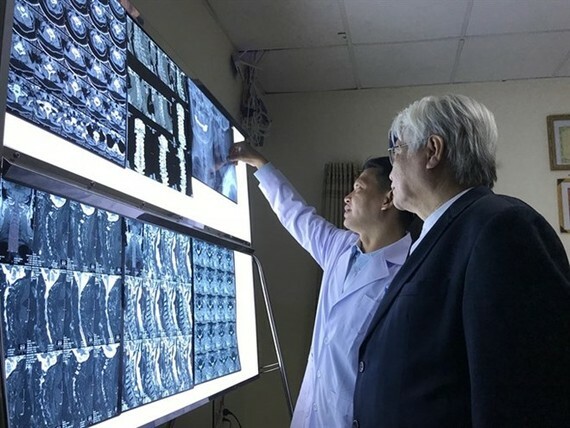 Recently, the Trung Vuong Hospital admitted a 76-year-old man from HCM City with cervical myelopathy caused by cervical stenosis and spondylosis. Degenerative changes due to ageing narrowed the neck’s protective spinal canal, leading to cervical spinal stenosis. For at least a year, the man had weakness in the muscles of his arms, leading to problems in grasping and holding items. He also had coordination problems, which affected his walking. He has lost fine motor skills, leading to difficulty with handwriting, buttoning his clothes, and feeding himself. Dr Ho Nhut Tam, head of the hospital’s spinal unit, said that surgery should be performed but there would be risks because the patient suffers from hypertension, diabetes, gout and chronic kidney failure. The patient currently receives dialysis. If the surgery is not performed, the spinal cord could become more compressed and paralysis could occur, Tam said. After consultation with Dr Thanh, doctors decided to use the Tateru Shiraishi cervical laminoplasty to limit risks, he added. The hospital’s doctors worked with Dr Vo Ngoc Thien An from the Hospital for Traumatology and Orthopaedics to conduct the operation 13 days ago. The patient’s motor skills improved three to four days after surgery. He is expected to completely recover after three months of physical therapy, Tam said. Dr An said that doctors who perform this technique must be well-trained and have practice as it requires high precision. The aim is to prevent postoperative complications such as damage of blood vessels that connect to the spinal cord. Cervical myelopathy tends to get worse slowly over time, An said. Dr Thanh said that if patients are diagnosed in time, the success of surgery is high. Dr An said that symptoms include numbness in one or two arms from the shoulder to the hand.